Hi everyone, I hope you are all well, it has been a while since my last post as I have been quite busy lately. Jane sent me this lovely mail art gift to me, it was a total surprise! It was full of these lovely threads and a threadwinder, thankyou Jane I shall treasure this! Here are some close up pictures. I have just one more photo to show of a biscornu that my friend Connie has made, but I will show that in my next post. I am going away for a couple of days to celebrate our 26th wedding anniversary and my 50th birthday, I am quite looking forward to the celebrations, we are going to one of my favourite parts of the country - Bath. We are having lunch at the Pump Rooms in Bath where Jane Austen used to visit quite regularly, I will update you on my return, and hopefully I will have some nice photographs to show you all. Hi everyone, I thought it was time I showed a cross stitch finish after all the felt projects I have been making lately. I started this Holly Berries design from Little House Needleworks before Christmas but I have only just got around to finishing it. I decided to make it into a mattress pin cushion following some really helpful instructions over at Andreas blog - The Craft Room here. Thanks Andrea, your instructions are really easy to follow! I have received a beautiful surprise gift in the mail from Jane, a lady whom I sent a random act of kindness to at the beginning of the year. Jane has sent me a lovely mail art with some delicious threads to match. I am unable to post a photo yet as I am trying to edit the personal address details off the photograph and I am unsure how to do it. Thankyou Jane for this wonderful surprise! I have also received a photograph from Connie who has made a lovely biscornu from one of my patterns, I shall show that in my next post. Talking of surprises ( well, not a total surprise because I gave him the list of choices) I received this Country Cottage Needleworks Pattern from my son for Mother's Day today, I cannot wait to start stitching this! Thankyou for visiting and leaving such wonderful encouraging comments, I really appreciate them all. Mothers day gift and redwork lady. Hi everyone, I thought I would show you the Mother's day gift I have made. 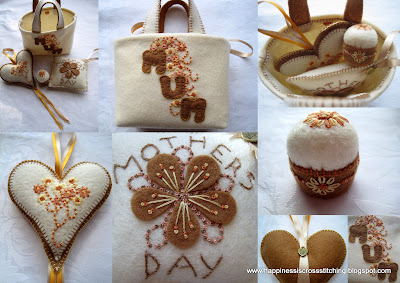 My Mother loved the little Valentine bag here with the pin cushions so much that I decided to make it all again, but in her favourite colours of creams, coffee and gold. It is amazing how different it looks in a softer colour palette. I made the little bag just a bit larger than the last one, I embroidered the design free hand onto the front and made the little pillows and the bottlecap pincushion to go inside. I have also finished my first attempt at redwork, this pattern was a freebie from here ( Needlecrafter website ) there are so many lovely emroidery designs to down load and trace for redwork or any embroidery project. I am unsure how I am going to finish this, I may make it into a quilted wall hanging but I need to buy some red fabric to complement the design. I used a special disappearing ink pen to trace the design but it disappeared to quick for my liking, so the next design I traced using a fine pencil. All the blue marks have completely disappeared now. Rebecca at Gather Ye Roses Blog is having a lovely giveaway until the 20th March, if you have never visited Rebecca's blog then do so now as she makes some gorgeous creations, you won't be disappointed! I would like to welcome all of my new followers to my blog!